Via small farming villages you drive along the Baltic Sea, where you can take several breaks while also going for a swim. In addition to dreamy villages with historic churches, secluded forests and a great variety of flora and fauna, there are many things to discover on this tour. Start in Wismar. 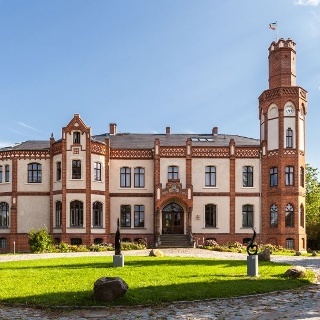 In a north-westerly direction, you will reach the resort of Zierow via Hoben, where you can visit the local history museum 'Heimatmuseum'. The flat natural beaches of the Wohlenberger Wiek, which are especially popular with families with small children, offer a variety of bathing possibilities. During a visit to the sanddorn shop of the Pagels family in Wohlenberg, you are sure to find a souvenir for those who stayed at home. On the way to the seaside resort Boltenhagen you can make a stop at the marina 'YachtWelt Weiße Wiek' with the old fishing port. In the former fishing village Hoben near Wismar you feel transported back to the 19th century. The old hall houses are under preservation order. Start your tour in Wismar and drive via the park 'Park der Solidarität' and past the marine engineering shipyard 'Meerestechnikwerft'. On the Ernst-Scheel-Straße you reach the pier and can enjoy a beautiful view from here. Continue along the Baltic Sea to Hoben. Shortly after leaving the village turn right and drive via Fliemstorf to Zierow. In Eggerstorf turn left and follow Stadtweg until you turn right in Beckerwitz on Moorweg. At Beckerwitz Ausbau you come to a road fork where you turn left. Then turn onto Landstraße. Here you drive via Wohlenberg to Eulenkrug. Turn right here onto An der Weißen Wiek and follow the road until you come to a roundabout. 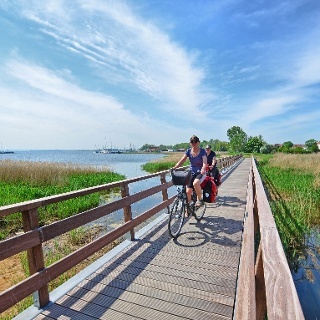 Take the second exit and continue on Tarnewitzer Huk and Ostseeallee into the center of the seaside resort Boltenhagen. Having arrived in Boltenhagen, there are numerous opportunities to relax and explore the location. The Flix Bus runs between Wismar and Hamburg. By train you can reach the Hanseatic city via Bad Kleinen or Rostock. Follow the motorway A20 to Osttangente Wismar. Or, coming from Hamburg, take the A20 to the B208 Dorf Mecklenburg and then take the exit 8-Wismar-Mitte.